With a Magnet Commerce subscription you can have e-mail addresses for you and every member of your team. Once your store goes live you need to let us know of the email accounts you want. You can also define the passwords you want for each account or we can set the passwords for you.
! Any of the email accounts you create can be forwarding accounts. For example, if there are two members in your sales team with accounts: partnerAname@my-store.com and partnerBname@my-store.com, the account sales@my-store.com can get forwarded to those two emails. This way, when an email is sent to sales@my-store.com, both of your sales partners will receive it. To let us know which email accounts you want to use, please contact us. We will inform you when the accounts are ready, so you can set them up on your preferred email client (Microsoft Outlook, Outlook Express, Mozilla Thunderbird etc.). Following is an example of how you can set up an email account. 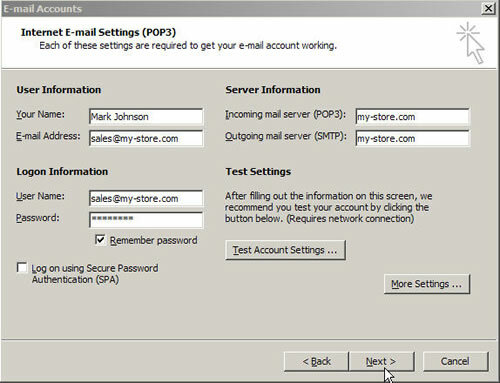 In this example, the email client we will use for setting up the account is Outlook Express. Make sure you have first downloaded and installed your email client (in our case Outlook Express) before proceeding. Once you have downloaded and installed your email client (Outlook Express), open the application. When the application is open and running, go to "Tools", then select "Email Accounts" from the pull-down menu. You should now see a pop-up window labelled "Email Accounts". From the pop-up window, select "Add a new email account", and click "Next". "Next". You should now see a pop-up window on which you need to choose the server type for your account. 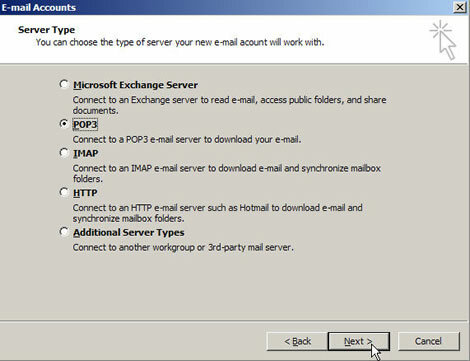 Select the POP3 email server for downloading your email and click "Next". - A name for your account. This name will show up on all mail sent from the e-mail address you are setting-up. - Your password. 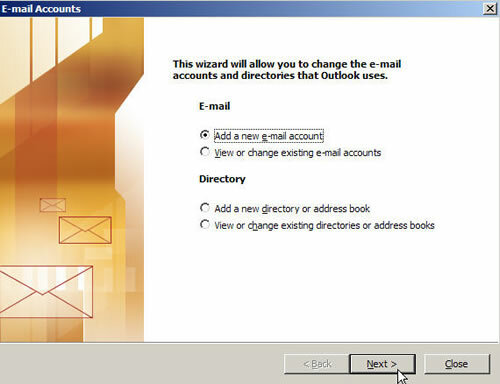 If you wish, Outlook Express will save your password so you don't have to enter it each time. Make sure the "Remember Password" box is checked if you wish to store your password. Do NOT check "Log on using Secure Password Authentication (SPA)". - Your Incoming and Outgoing E-mail Servers. These are you domain name, for example www.my-store.com. Note that you can also use your ISP (your Internet Service Provider, the company that provides your Internet connection) for your outgoing mail server (SMTP). If you do this, the process of sending your emails will be faster. When you have filled out this information click "Next".
! 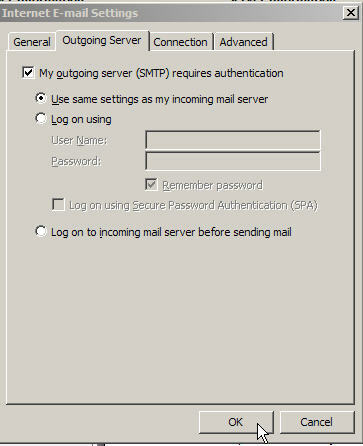 If you have set your SMTP server to your store's domain name (and not your ISP), you need to enable SMTP server authentication: Click on "More Settings", select the "Outgoing Server" tab from the pop up window and check the box that says "My Outgoing Server (SMTP) Requires Authentication". Once you have checked the box click "OK" to save and close. 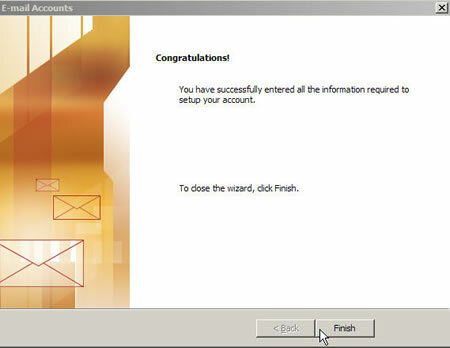 You have just completed setting up this account in Outlook Express, and should see the screen shot below! Be sure to click on the "Finish" button on the bottom. When you have finished all 4 steps, send a few emails to and from the account you have created, to check that everything works as expected.